The Australian Government's Productivity Commission has endorsed the use of VPNs and similar unblocking tools to give consumers greater choice. The agency says that new anti-piracy legislation has had only a "modest impact" on infringement so improved access to legal content is the preferred solution. Documents published today by the Australian Government’s Productivity Commission contain a more balanced set of recommendations, several of which are likely to provoke an adverse reaction from both local and international rightsholders. The Intellectual Property Arrangements draft report is a 600 page epic covering everything from copyright and patent issues through to pharmaceuticals and plant breeders’ rights. Of most interest to readers will be the agency’s comments on infringement, fair use and copyright terms. For years Australians have felt that when it comes to entertainment content they’re treated as second class citizens. Aussies believe that not only do they pay over the top for content, but they also have to wait longer for it to arrive. As a result many access overseas services by using a VPN, something which is frowned upon by rightsholders and actively blocked by companies such as Netflix. Nevertheless, the Productivity Commission wants to do everything it can to open up options for consumers. “Geoblocking results in Australians paying higher prices (often for a lesser or later service) than consumers overseas,” the report reads. But the Commission doesn’t stop there. In case any foreign country wants to pressure Australia into acting otherwise, the agency advises the following. 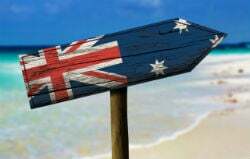 “The Australian Government should seek to avoid any international agreements that would prevent or ban consumers from circumventing geoblocking technology,” it adds. The Productivity Commission notes that enforcement is a key factor in the efficiency and effectiveness of the Australian IP system. It also acknowledges that copyright infringement is an ongoing issue. That being said, rightsholders probably aren’t going to like the draft’s conclusions. 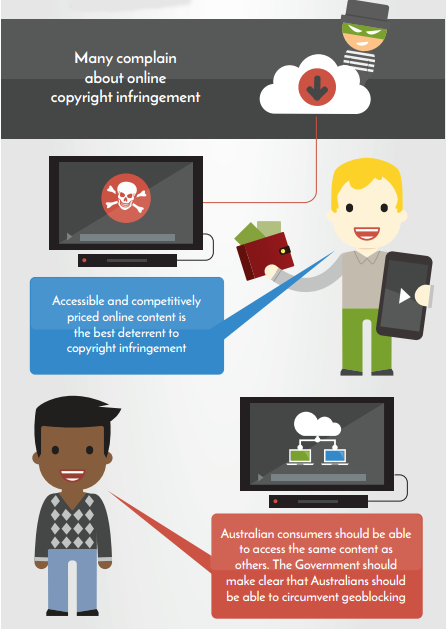 “Online copyright infringement remains problematic for rights holders. Evidence suggests many people infringe copyright because of the ongoing difficulty and cost in accessing content,” the report notes. It’s not difficult to see how these statements dovetail with the recommendation on VPN use and the pressure could eventually see Aussies getting a better deal. But for rightsholders hoping for more enforcement options in the meantime, only disappointment awaits. “Changes to the law to encourage Internet service providers to cooperate with rights holders, as well as litigation, have only had a modest impact in reducing infringement. Further legislative change is unlikely to improve compliance with the law,” the report states. In keeping with the positive response to increased consumer choice, proponents of expanded fair use provisions and diminished copyright terms also have something to celebrate. 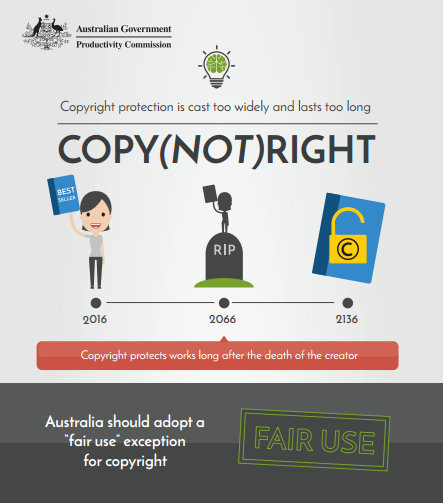 “Australia’s copyright system has expanded over time, often with no transparent, evidence-based policy analysis demonstrating the need for, or quantum of, new rights. A new system of user rights, including the introduction of a broad, principles-based fair use exception, is needed to help address this imbalance,” the report notes. And on copyright terms, yet more consumer-friendly advice. “The term of protection for most works is now more than 70 years and considerably longer than necessary to incentivize creation of most works (with a commercial life less than 5 years). The current duration of copyright imposes costs on the community and access to works is restricted, particularly for works not commercially available but still subject to copyright protection,” the draft reads. The report is currently in draft and written submissions are invited up until Friday 3 June 2016. The final report will be handed to the government in August and published shortly after.